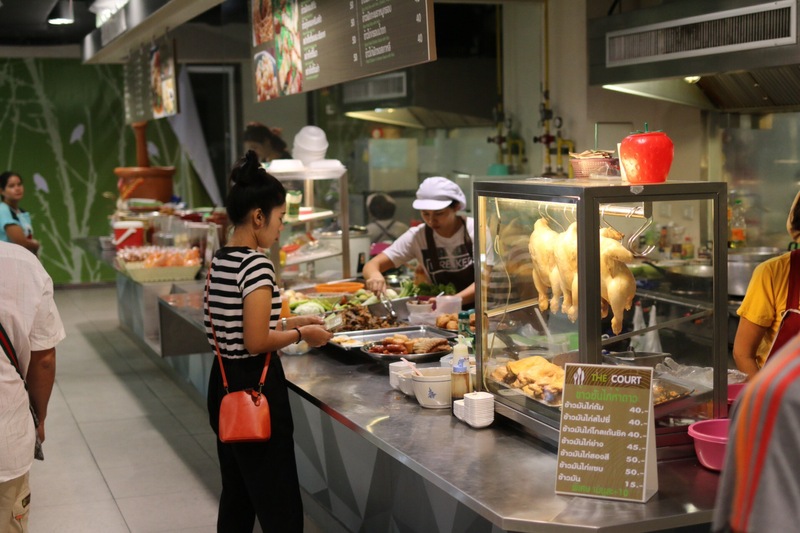 You’re truly spoiled for choice when you walk into a Thai food court. It is a Thai food lovers dream as you can get a lunch sized meal for about £1.50. 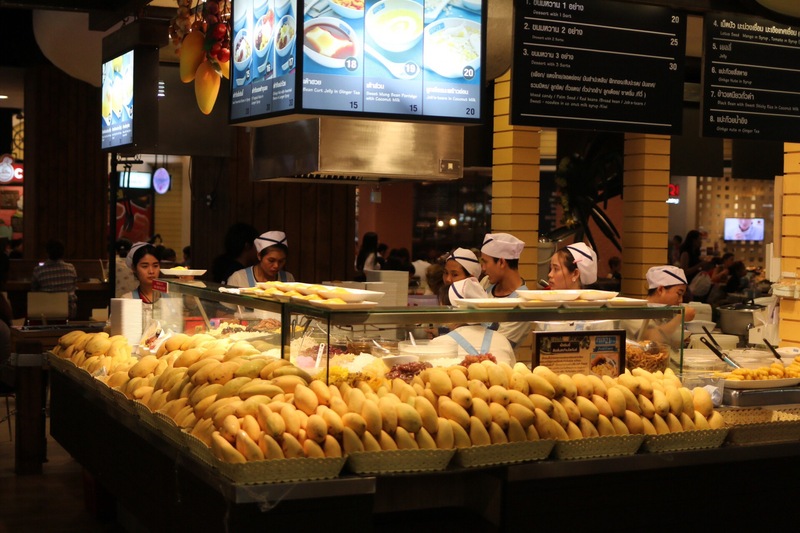 Food courts are present in shopping centres across the globe, but the ones you find in Thailand are something else. You can buy all the classic thai dishes you would expect to see on a five star Thai menu in the UK. Pad grapow, spicy papaya salad, noodle soup and all the curries and stir fries. 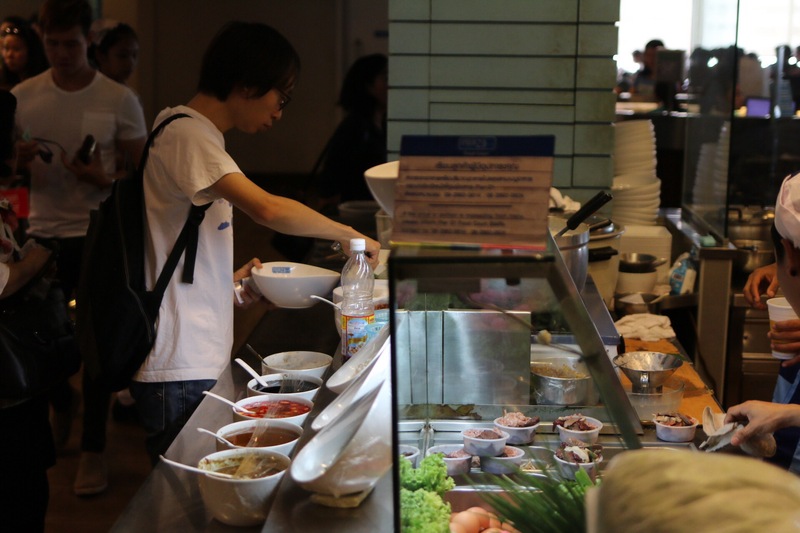 A huge selection is available and cooked to order in front of you. 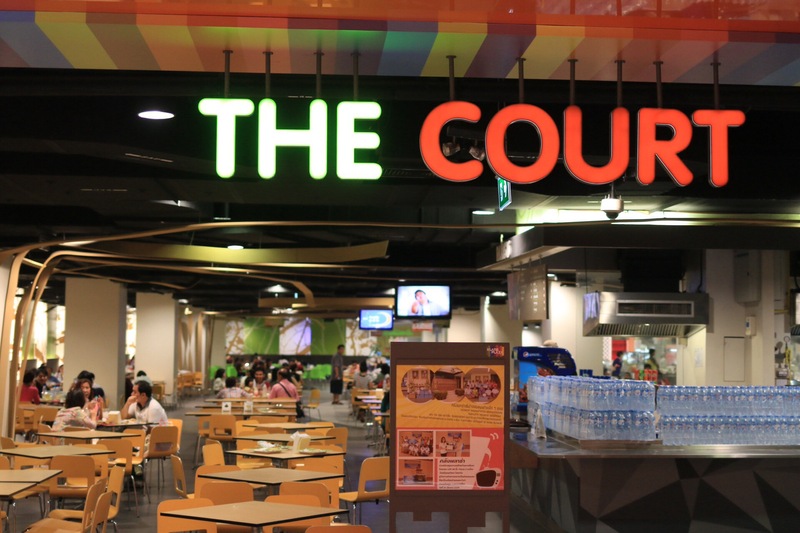 Food courts operate on a voucher system, so no cash is exchanged between customer and vendor. Vouchers are bough when you enter the court at a kiosk and can be returned at the end of your visit in exchange for cash. Some of the stalls focus on just one product. 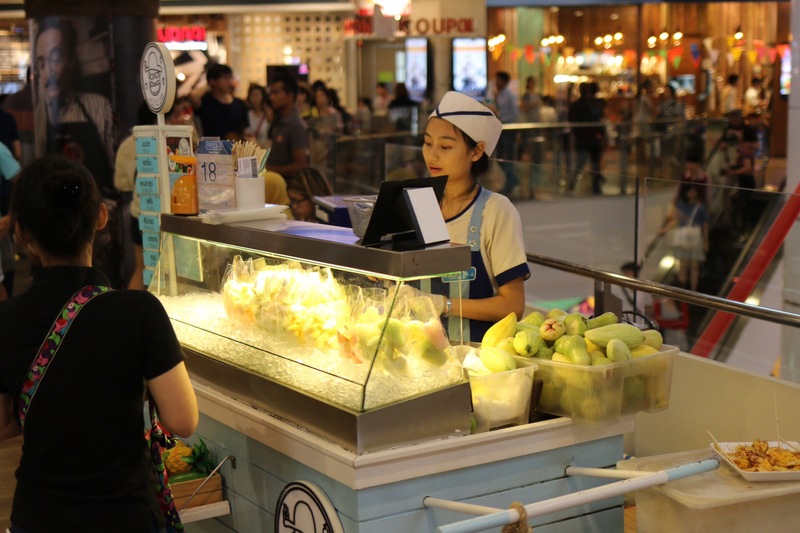 The stall below sells fresh mango with sticky rice and a variety of different toppings. Other stalls sell freshly prepared fruit to take away. “Gwi-tiow” is thai for noodle soup. The guy below is adding chillies and garlic to his noodles. 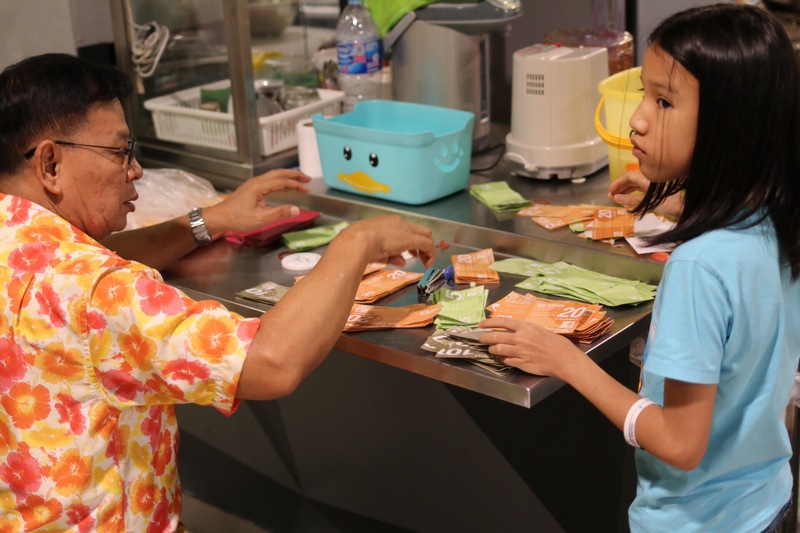 Gwi-tiow is a favourite amongst Thai nationals and you can expect to find multiple gwi-tiow stalls at any food court. All the curry pastes and sauces are home made with fresh locally grown ingredients. Thailand does not do mild when it comes to curry be sure to ask for “ped nid noy cap” which means little bit spicy please! “Kaw man gai todd” Thai for fried chicken with rice, is sold with a clear soup made from the chicken stock accompanied with spicy ginger dipping sauce and sliced cucumber. 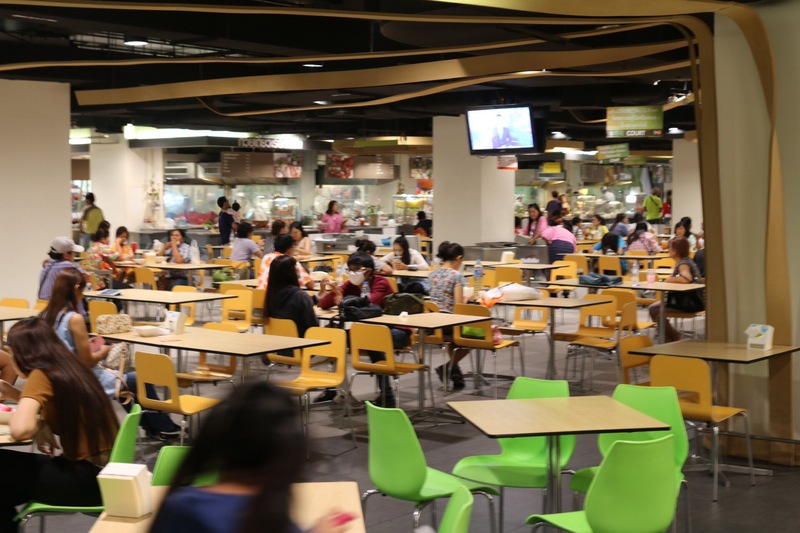 Food courts are bustling places where people from all walks of life come to eat and socialise. They are quick and easy dining areas, serving excellent quality fresh food and best of all, air conditioned. This makes for a nice escape away from the scorching heat outside!